Enjoy a personalized small group experience on this swamp tour just 35 minutes outside of New Orleans. 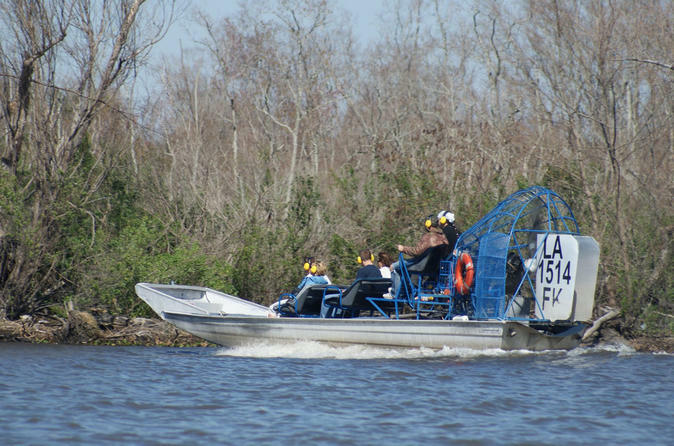 This airboat has a maximum of six or nine passengers giving you plenty of room to admire the views of the Louisiana marshlands from all angles. Your day begins as when you arrive at the departure location in Marrero, a 35 minute drive outside of New Orleans. You will be introduced to your captain and briefed quickly on procedure inside of the Airboat. Once everyone in the group is prepared to take off you captain will rev the engine. This particular airport is powered by a 454 Chevy Engine that's capable of accelerating to speeds as high as 35 miles per hour. The boat is propelled by a large fan behind the boat which can deliver wind speeds of over 200 miles per hour. This tour is fast and loud! Your tour guide will bring you from location to location around the swamp and make frequent stops for you to have encounters with the wildlife. Chances are you'll probably have some reptilian visitors. The alligators have no problems making their way to the side of the boat and showing off for the visitors. After the tour of the swamp is complete you will be returned to the original departure location to make your way back to New Orleans.